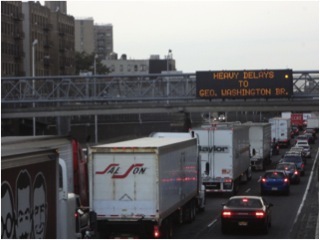 Tomorrow night BronxTalk will present your first look at the "Cross Bronx Expressway Initiative," a movement by some forward-thinking Bronxites to try to address the nation's worst highway and a virtual killer in the Bronx. Bronxnet's channel 67. 9 p.m. Monday night. Bummer: A Nor'easter is headed our way. Restaurant Week in the Boogiedown (Savor the Bronx) and its featured restaurants are all well and good, says Gothamist, but there are many under-noticed culinary gems in the borough that deserve your attention. The Occupy Bronx protesters, who have been meeting at (but not really occupying) Fordham Plaza on Saturday have a famous borough-based corporate target in their sights: The New York Yankees. We linked to the Times story yesterday about the brand new Poe Park Visitors' Center being padlocked indefinitely for lack of staffing. The Norwood News, on its Breaking Bronx blog, reports that a Parks Department spokesman told the paper in June that the Center would be open within a month. A gritty but glorious effort to showcase a sculptural dome made mostly of umbrella spokes -- created by two artists and volunteers based at Rocking the Boat in Hunts Point -- in the waters off of Inwood ran ashore last Wednesday on, of all places, Rikers Island. For different takes on the story see the Hunts Point Expess, and Jim Dwyer's NYT column. The Riverdale Press reports that the city won't built a pedestrian footbridge to connect parts of Van Cortlandt Park separated by the Major Deegan Expressway. The footbridge was embedded in the City Council's approval to site the filtration plant in Van Cortlandt Park, a project whose cost has tripled to $3 billion. Montefiore is tweeting its job openings @MontefioreJobs. Here's one. Stable stats aside, crime is getting more violent in Marble Hill. The Bronx's first restaurant week, officially known as Savor the Bronx (we mentioned it in yesterday's roundup) is getting a shoutout from ZagatBuzz. "The borough is giving everyone an excuse to get their butts way uptown," the site says. The Irish Echo reports that the Transportation Committee of Community Board 8 has given its OK to the naming of a street near Gaelic Park in Kingsbridge for the late human rights activist and lawyer Frank Durkan. Kappstatter gives us the rundown on what the political machinations may be behind Bronx Democratic boss Carl Heastie not nominating a new executive director of the city Board of Elections for more than a year now. Also in the column, is news of the first meeting of the Bronx Young Democrats Club tomorrow night. The New York Times Arts section reports some hard news about the new Poe Park visitors' center being shuttered and vandalized for lack of funding to staff the raven-shaped building. This video explains the history of the High Bridge, which is due to open to pedestrians in 2014. The first ever "Savor the Bronx" restaurant week from Nov. 1 to Nov. 13 will feature 20 percent discounts at participating restaurants and more. A massive West Farms development project is moving closer to reality as the properties on which it will sit have been rezoned by the City Council. The mixed-use project will include 1,300 units (half of them affordable housing) and 46,000 square feet of retail space. It straddles both sides of the Cross Bronx Expressway. The Tremont Tribune reported on planning for the development back in June. Former Council Speaker Gifford Miller is a partner in the development firm, Signature Properties. More coverage here and here. The Grand Concourse, from 153rd Street to 167th Street, was designated as a historic district by the city's Landmarks Preservation Commission yesterday. More history of the century-old thoroughfare here. A new species of bat is named for researcher at the Bronx Zoo. The new Marion Avenue Neighborhood Association formed after a wild gun battled earlier this month on Oct. 9. Bronx hip-hop duo Rebel Diaz performs their "We're the 99 percent" rap for Democracy Now! Occupiers and Northwest Bronx Community and Clergy Coalition activists merged agendas on Saturday. Norwood News has the story. BronxTalk last night featured experts on the impact of plastic bags on our planet. Just click play above and learn. 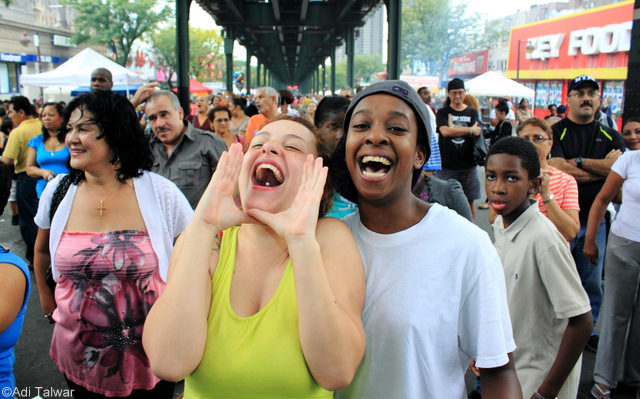 While you were sleeping, Bronx Ink documented the goings on at the Fulton Fish Market. Also getting some Ink: The Morrisania post office is one of 18 in the Bronx on the chopping block. Everyone's wondering what the Occupy protesters are going to do as the temperature drops. City Limits has some answers. Yesterday was Food Day in New York City, and Sen. Gustavo Rivera used it as an opportunity to continue to push his Bronx CAN Health Initiative at the Academy of Mt. St. Ursula in Bedford Park and to announce that he's lost 16 lbs. of the 20 he pledged to lose at the start of the initiative. Capital has this terrific in-depth story that takes a look at the struggles of a Chinese take-out restaurant in Mott Haven. It's also interesting how the reporter ended up profiling this particular establishment. More delays for an ice skating rink planned for Van Cortlandt Park, The Riverdale Press reports. The Bronx Documentary Center opened in the Melrose section of the Bronx on Saturday. 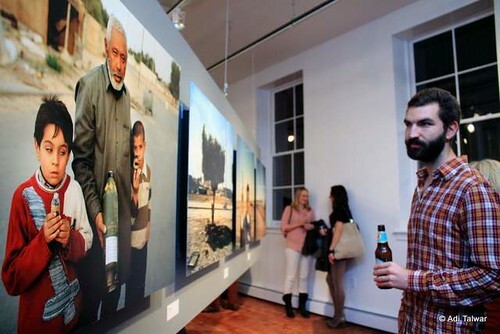 The Center, located at the intersection of Courtlandt Avenue and East 151st Street, launched with an exhibition of multimedia and photographs by the late photojournalist Tim Hetherington (including his video work shown on the wall of a building across the street from the Center). Hetherington died tragically last April while covering the conflict in Libya. Last week, BDC founder Mike Kamber posted a moving article on the New York Times Lens Blog about Hetherington, a good friend who helped inspire him create the center. The opening attracted hundreds of people that crammed the storefront gallery and its backyard. The crowd included journalists -- including the author and war reporter Sebastian Junger -- as well as photographers, students, family and friends of Hetherington, and Bronx artists and enthusiasts. For me, the experience of attending the opening was inspirational at many levels. Making photographs in the presence of famous photojournalists was daunting, scary and thrilling. Click here to view more photographs made during the resoundingly successful opening. More than 6,000 bikers participated in yesterday's 17th annual Tour de Bronx, a bike ride that circles the entire borough. 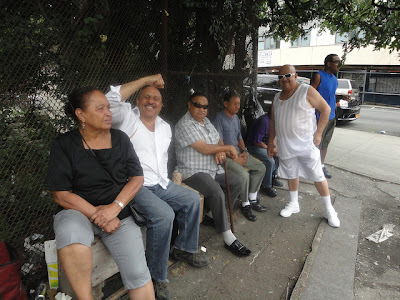 (Video) If you went and have photos, send us one at bronxnewsnetwork-at-gmail.com. We'll post some! From the Daily News today: PS 8 in Bedford Park has as many as 40 students in a classroom but new legislation requiring the Department of Education to provide more details in their reports on school capacity won't fix the perennail rampant overcrowding in local schools, parents say. What will? Building more schools. The issues of whether the Bronx Household of Faith can use PS 15 for its Sunday services is a national issue with this latest report from UPI. Norwood News had this in-depth report back in June. Supermodel Tyra Banks surprised 400 students at the High School for Teaching and the Professions at the Walton campus in Kingsbridge Heights last Wednesday, bringing her Get Schooled Foundation agenda to the college bound. A nun who has been in her Hunts Point Parish for 49 years celebrated 60 years in the Sisters of Charity despite her being dismissed, along with other church staff, by the church's new pastor. Councilman Fernando Cabrera talks about his legislation to require the NYPD to release crime data for sectors within precincts, an issue raised by the Norwood News and BxNN. Twelve people are running the New York Marathon to support the large social service organization BronxWorks. Speaking of BronxWorks, it was one of eight organizations citywide to be awarded a city contract to develop an Innovative Senior Center. According to the Nonprofit Press, "Innovative Senior Centers will be held accountable for producing vibrant programs, high participation rates and better health outcomes for older New Yorkers." Shootings are up in the Bronx and throughout the city. Affordable housing construction projects, including some in the Bronx, are under scrutiny by the city and feds for wage infractions and kickbacks. The HUB business district on East 149th Street now has a Facebook page. Bronx Underground is having a Halloween Party on Oct. 29. It took a few weeks but Bronxites are getting together to support the protest movement that began in Zuccotti Park and has spread across the country and the world. Breaking Bronx, the Norwood News' new blog, has a good roundup on Occupy activities and coverage, including news of Occupy Bronx getting together with the Northwest Bronx Community and Clergy Coalition for its big meeting tomorrow at St. Nicholas of Tolentine Church. Some more coverage in the Mott Haven Herald here, including Buddy Stein's editorial supporting the borough's entry into the fray. Talk about a teachable moment: Parents who long to show their kids what democracy looks like but worry about bringing them to a crowded protest heavily dominated by adults, are in luck. Occupy Wall Street is hosting a family evening and sleepover tonight in Zuccotti Park. Another draw is kids' music star Dan Zanes. The New York Times' "Lens" blog highlights the new Bronx Documentary Center in Melrose, which will show the work of Tim Hetherington, the photo-journalist who died in Libya and was an inspiration for the birth of the Center. In Bronx Ink, Yemenis talk about the turmoil they left behind. A federal grant comes to the Bronx to protect women victims of abuse and to track the cases of their attackers. Riverdale Press covers the borough's first education summit ever at Lehman College. What a mess: The Press also reports on the lousy conditions at the new location of PS 51/The Bronx New School. More chemicals, a leaky roof, and lousy wiring are riling parents who were already fed up after being told in August that the Bedford Park school had to close because chemical contamination discovered at the site. 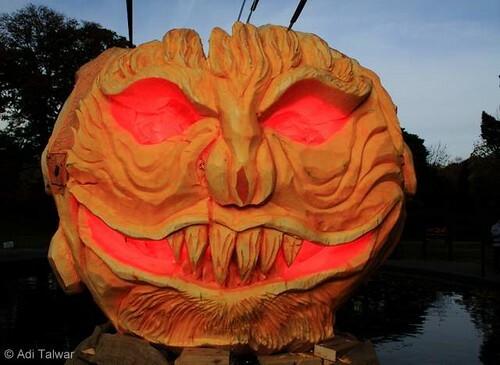 Yesterday, the world's largest pumpkins arrived at the New York Botanical Garden. 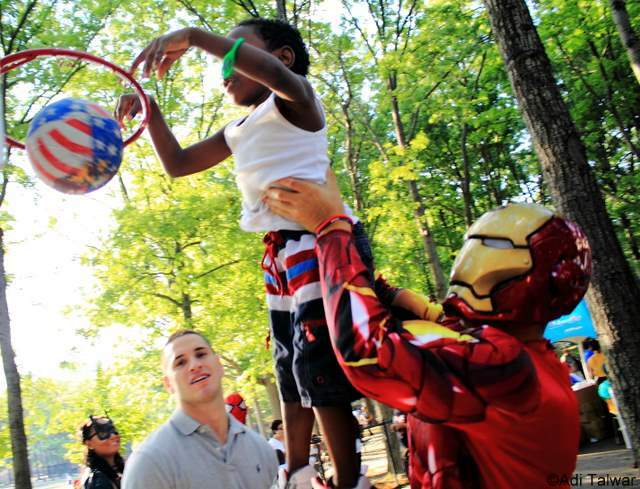 And like last year, the Garden is hosting fun activities for children and adults through Halloween. Details here. 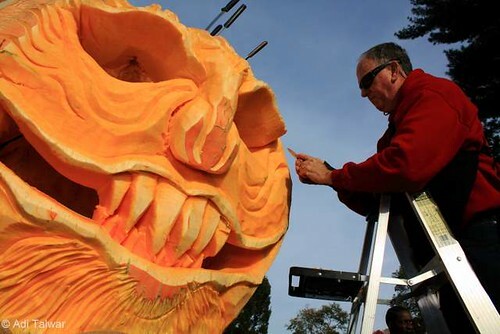 These photos are from last year's festivities where Scott Cully gave shape to the biggest Jack-O-Lantern on record. Click here for more photos. For months, advocates of living wage legislation, including 30 members of the City Council, have pushed to get the bill a hearing, a necessary step in getting the measure through the chamber. The stumbling block has been Council Speaker Christine Quinn, who was boosted into the Council from a progressive foundation of community organizing and housing advocacy. But in positioning herself to run for mayor, Quinn has tiptoed carefully between business interests and the determined campaigns of labor and grassroots groups around the city. Questions about the issue make her testy. "You’re like a dog with a bone,” she told a Daily News reporter who asked her about the legislation last week. Quinn relented Monday and agreed to a hearing. The move came after the bill supporters, including the Bronx's Oliver Koppell and Annabel Palma who authored it, watered down the legislation so that it wouldn't apply to developments receiving less than $1 million in subsidies or to businesses with less than $5 million in revenue. 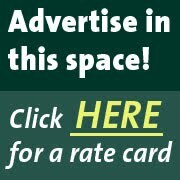 And last week, every state lawmaker in the Bronx, except for State Senator Jeff Klein who formed an Independent Caucus in the Senate with a few conservative Democrats, wrote to Quinn in support of the legislation, which grew out of the battle over a city plan to to subsidize the Related Companies mall project at the Kingsbridge Armory. "Given the millions of dollars in profits developers take home to make these projects work, and the heavy subsidies that supplement that profit, we do not think it is too much to ask that the jobs created offer a 'living wage,'" the pols wrote. "In fact, it is the very least we can do, especially when these developers are taking so heavily from the taxpayers' wallet." Yes, Quinn could table the bill after the hearing like she did with sick leave legislation last year, but this time there's the minor issue of a worldwide protest movement with a focus on income inequality taking root a stone's throw from Quinn's City Hall office. And if those protesters planting their flag in Zuccotti Park have shown one thing, it's that they don't mind taking a walk now and again. Here's a link to last night's BronxTalk that featured Occupy Wall Street and Occupy and the Bronx with activist Ephraim Cruz and Monroe College criminal justic professor Augstine Aloia, who analyzed police resopnse. Please click here to see one more from that day. A spirited group of Puerto Rican regulars meets up for fun and friendship at this corner in Melrose (photo above by F.G. Pinto). The Mott Haven Herald has the story. City Hall has a must-read today, questioning why there are no likely Latino candidates waiting in the wings for the 2013 mayoral race, just like in 2009, despite there being 860,000 registered Latinos in the city. “There is a crisis of leadership in the Latino community,” Jaime Estades, the president of the Latino Leadership Academy, told the paper. “The Latino politicians, they just go through the motions.” Some observers like Estades said too many young pols wait in vain for signals from Democratic Party bosses. Fernando Ferrer, the last Democratic candidate for mayor, disagrees and points to several up-and-comers like Bronx Borough President Ruben Diaz, Jr. and State Senator Jose M. Serrano. A stalled bridge project that is key to connecting parts of the Bronx River Greenway, may finally make some headway now that the federal Interior Department has stepped in to try to broker a deal between the state Department of Transportation and Amtrak. 30 Rock star Tina Fey took a stroll in the New York Botanical Garden on Monday with her newborn and 6-year-old. Here's a video report from NY1 on that tense meeting PS 51 parents had with Schools Chancellor Dennis Walcott last week. A veteran Department of Education red-tape cutter, who spends his day visiting principals all over the Bronx, proves that "bureaucrat" is not a dirty word. Bronx Ink has an audio slideshow reporting on the reopening of Poe Cottage on Oct. 15 after a renovation. Jasmeet Sidhu of Bronx Ink, which is an on-line paper published by Columbia journalism students, records a lively debate between two Norwood storeowners -- Allan Freilich of Freilich Jewelers and Eamonn McDwyer of McDwyer's Pub -- over who has the oldest store. A Bronx stop on the farm-to-table food chain gets some coverage in the Capital. Labels: Bronx news roundup, Melrose, ruben diaz jr.
A Bronx reverend was arrested for cashing the pension checks of a teacher who died a decade ago. Jury selection is set to begin on Nov. 7 in the trial of Councilman Larry Seabrook and his legal team is talking strategy. The city may come to the rescue of the parking garage company that's near bankruptcy thanks to fans that have avoided the expensive parking option like a batter dodging a beanball. 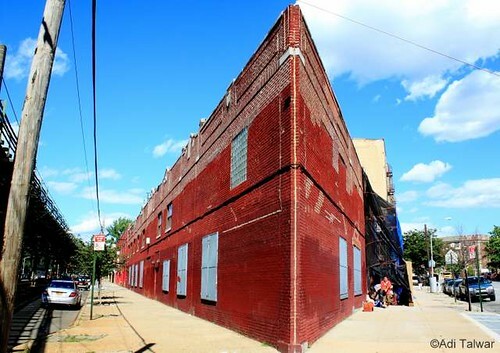 Affordable housing may be in the mix and the borough president is still pushing for a hotel. The Tour de Bronx, a cycling event that takes riders on a glorious ride around the entire borough, is on Oct. 23 and registration is underway. Assemblyman Dinowitz is proud of his near-bottom ranking from the state's Conservative Party. Nos Quedamos (We Stay), the nonprofit that was a key proponent of rebuilding of the arson-leveled neighborhood of Melrose, is under investigation by the state attorney general's office, according to the Bob Kappstatter of the Daily News. Board members have fired Yolanda Gonzalez, the executive director and daughter of the group's late founder, Yolanda Garcia. They say she put relatives on the payroll and drained the group's bank account. The Bronx Ink profiles the south Bronx activist hip-hop group Rebel Diaz. On BronxTalk this Monday night Ephraim Cruz of Occupy the Bronx will join Monroe College criminal justice professor Augustine Aloia in a discussion with host Gary Axelbank about Occupy Wall Street. Mr. Cruz will talk about the protest and the demonstrators, while Professor Aloia, a former NYPD detective, will evaluate the police tactics being used. Viewers can call in at 718-960-7241. Now in its 18th year, BronxTalk is seen on Bronxnet's channel 67 every Monday night at 9pm. Bronx State Sen. Gustavo Rivera goes back to his roots in academia to teach a series of civics classes that start tonight at 6 p.m. at the Bronx Library Center. Click here for the full story from the Norwood News. Ray Lopez's 8 and a 1/2 was on display this summer at BronxArtSpace. The work of four artists who met each other while working at The Point CDC in Hunts Point was on display at Mott Haven's BronxArtSpace Gallery in August. The Mott Haven Herald has the story. Yesterday, Bronx Borough President Ruben Diaz, Jr. kicked off registration for the 2011 Tour de Bronx, which is scheduled for a week from Sunday, Oct. 23. For the full story from the Norwood News, click here. A security guard apparently shot himself to death on the roof of the Bronx district attorney's office on East 161st Street. New York Times columnist Michael Powell looks at the living wage battle through the eyes of a south Bronx mom struggling on $9.25 an hour with no benefits. The crime and murder rate is way up in Morris Heights and the rest of the 46th Precinct -- including four murders in the last month -- and Assemblywoman Vanessa Gibson organized a rally in response. Some custodians at Jacobi Medical Center are earning healthy six-figure salaries. The parade grounds in Van Cortlandt Park will be closed to cricket players and other athletes until next fall, depriving park users of the fields for a third straight season. The reason? Too many weeds among the new grass. Needless to say, the players are not happy. Arlene McLaren, a former staffer of Councilman Oliver Koppell, has been hired as the executive director of the Charles County Chamber of Commerce in Maryland. Muggings in the Williamsbridge Oval brought Norwood residents together for a march in the park. Norwood News interviews Lehman Center for the Performing Arts executive director Eva Bornstein for a preview of the organization's 31st season. Mott Haven Herald reports on those Queens chickens migrating to Brook Park in the Bronx. Bronx Ink asks the question: Why is Heritage Field Still Closed? The Panel for Educational Policy meeting this Wed. is likely to attract a bigger crowd than usual, as Bronx New School parents and their supporters will bring their complaints about the lack of information about toxins at their old school site in Bedford Park and possibly at their new site in Crotona. Click here for info. I made this photograph on August 2, during the National Night Out event at the Williamsbridge Oval Park. Enjoy the long weekend, everyone. If you're looking for something to do, go no further. Put aside for a moment what a bummer it is for Yankee fans that their $200 million team didn't get past even the first round of this years' playoffs. What about the loss of tax revenue for the city resulting from the absence of hundreds of thousands of fans in the coming weeks? Neil deMause, who writes regularly about sports economics, reports on the Village Voice blog that experts on this issue are pretty much on the same page that the impact is limited or even nonexistent. The long delayed baseball fields on the land that was occupied by the old Yankee Stadium will be accessible only if you have a permit, Dan Beekman reports. David Gonzalez has a new column on the Times' City Room blog called Side Street. It features his writing and photography. His first one is about a community garden in the south Bronx that has suffered from recent thefts but presses ahead to bring Puerto Rican heritage and healthy food to the community. The borough's Republican commissioner at the city's Board of Elections, J.C. Polanco accuses a Manhattan Democratic commissioner of verbally threatening him and agency staff. Some tenants say the system intended to make sure that landlords provide heat to tenants in broken. Local schools may lose staffers from layoffs as early as today, the Riverdale Press reports. Unless they're convicted of a felony, cops involved in the ticket-fixing scandal will receive their full pensions. Can't make the trip to the Wall Street protests? Big banks on local streets are a target worthy of your ire too, the Riverdale Press opines. This slide show on Bronx Ink follows a Soundview resident as he marches and rallies at Occupy Wall Street. Bronx Ink also reports on the occupiers showing solidarity with education workers protesting 700 school layoffs at City Hall. Revoking the registration of the bus company responsible for the bus crash that killed 15 people on the I-95 in the Bronx in March hasn't put the brakes on the owner who is still booking passengers through two other companies. A new building for a charter school in Hunts Point is the first educational facility built in the neighborhood in 30 years. The Times artchitecture critic who wrote that rare front-page review/appreciation of the Via Verde housing development in Melrose, followed up on the Times arts blog with a post and a video of his tour of the neighborhood with city planning commissioner Amanda Burden. Nice work, Mr. Kimmelman. Keep it up! A $4 million U.S. Army Corp of engineers contract will result in the restoration of wetlands in Soundview Park. A WNYC "radio rookie" filed a report on growing up in poverty in the Bronx. The Bronx FEMA center, set up after Hurricane Irene barreled through the borough, is closing today at 5 p.m.
As part of Carnegie Hall's neighborhood concert series, Chris Washburne and SYOTOS will perform on Friday at the Bronx Museum of the Arts. A look at how and why organized labor is getting involved with #occupysallstreet beginning with a big rally today. The final study on the effect of proposed living wage legislation by the city's Economic Development Corporation is out and guess what? They think it will limit economic growth and not help workers' that much. The study doesn't reflect changes to the legislation that reduces the number of businesses affected. 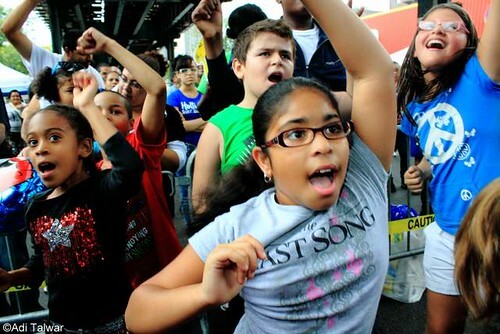 The Bronx Culture Trolley returns tomorrow. It's that time of year when middle schoolers and their families need to navigate the complicated high school application process. The terrific video above, created by insideschools.org, takes you through the steps with advice from high school students and educators. Also, check out Inside Schools' calendar of high school open houses and Department of Education sessions in each of the boroughs. The Bronx has sessions on Oct. 12 and 20. A Bangladeshi restaurant in Parkchester gets a great review in the Times. As we mentioned in a September news roundup, Baron Ambrosia led the way in raising Neerob's profile. Speaking of Parkchester, a synagogue there, built in 1948, will close its doors on Oct. 31. The Daily News profiles McDwyer's Pub in Norwood is the last Irish bar on the neighborhood's bustling merchant strip of Bainbridge Avenue/East 204th Street, which as recently as the early 90s featured more than 20. The Norwood News examined the area's dwindling Irish establishments back in 2007. A large donation to a museum in Philadelphia comes from a Bronx native who wants to see more educational arts programming for kids. A top electric truck manufacturer hopes to open a factory in the south Bronx. POTS (Part of the Solution), a soup kitchen and multi-service agency on Webster Avenue in Bedford Park, is expanding with a new $8 million facility, reports the Norwood News. The Hall of Justice, the 4-year-old criminal court building on 161st Street that was supposed to be something of a civic architectural gem, is still plagued with faulty elevators, electrical wiring and fire alarms, not to mention a leaky roof and an underground parking garage and courtyard that remain off limits, the Daily News reports. Councilman Oliver Koppell said his calls for an investigation of the $421 million facility have gone nowhere. A City Island resident is the winning bidder for Rat Island, which he can see from his backyard. A 14-year-old boy in Mt. Eden fell out of his apartment window and died from his injuries at Bronx-Lebanon hospital on Friday. He was helping his mother put up curtains. After months of testimony, a Bronx jury is expected to soon issue indictments in the ticket-fixing scandal. The Manhattan College Jaspers defeated the Fordham Rams in women's tennis yesterday. The Norwood News reports that children in District 10, which covers most of the northwest Bronx, scored lower on state education math and English tests, compared with the rest of the city and state. PS 280 in Norwood, which has consistently scored well, and PS51/The Bronx New School scored well above their counterparts throughout the district. More on the city education front: To better understand the grading system for the city's school report cards, this "cheat sheet" from City Limits is a must read. The Bainbridge Avenue bakery that renovated after a 2009 fire only to be destroyed by another fire the same week it was to reopen, is returning to the block. The Living Wage bill that stemmed from the Kingsbridge Armory redevelopment battle is entering a new phase in the City Council, as the bills proponents, including Oliver Koppell and Annabel Palma, have changed the bill to make it affect less businesses and more attractive therefore to holdout Councilmembers. That puts Council speaker and mayoral hopeful Christine Quinn in a bit of a bind and she seeks to both widen her appeal in the business community, but also tend to the grassroots which gave her a boost into public office in the first place.